A great article on getting started as a small business on Facebook was in the NY Times today, was the “Most Emailed”. Follow these words of wisdom, and you’ll make a good showing. After you read the article, keep in mind that with Internet Farmer’s Newsletter Blog, you can automatically update your Facebook page, as well as MySpace, Twitter, LinkedIn, or any other social network, at the same time as posting to your blog. This is far from a political blog, but in this article from the NY Times today, I was THRILLED to see that WhiteHouse.gov is now run by the open-source software package called Drupal. For me as the Internet Farmer, I love open-source. The software is free, and after using it for over 15 years I’m pretty good at helping clients use it. It is the basis of most of my business. Without it, I would have no choice but to charge high fees that farmers may not afford. Using free software allows me to focus on service, and that is what client’s pay for. Personally, I don’t use Drupal. It’s a much larger package than me or my clients need in most cases. I keep it simple by using two open-source packages that do most of what anyone needs. I use WordPress for my Blog Newsletter, and Zen Cart for E-commerce. That covers 95% of what anyone needs for their website(s). It’s a real do-it-yourself thing, and it is supported by thousands of programmers and users around the world. People writing software like this are literally giving back by letting the community use, and improve upon, their software. That last part is key… improve upon. When you make the software better and share it with people, we are all better off for it. I think that idea goes a long way here. Not much different than two farmers sharing ideas is it? If you are ready to start using open-source software, contact me today, or start some discussion below. An article written yesterday in the NY Times made mention of what the Internet Farmer will call a “fantastic use of Twitter”. Are these the only good reasons to Tweet? No. But they are two VERY good ones. The first point is about solving a problem. The MTA is a public utility that hundreds of thousands of people use each day. There are accidents and changes that keep MTA workers busy, with little time to properly communicate the changes to those thousands headed for the subways at 5pm. Using Twitter, many of those people could be alerted of alternate routes and the reason for the issue. As a commuter, that knowledge is the power to get home on time. For the MTA, it’s the ability to notify a large audience for the time it takes to write a memo, which in turn creates a safer and more fluid environment among the chaos of New York City. Will everyone in New York City get that notification on Twitter? No. But lots will, and the major congestion can be avoided. It’s a win-win situation. Let’s also take a quick look at the second point. Again, the MTA is traditionally a large and not so friendly organization from the outside looking in. By using Twitter to discuss the details of construction and other news of what they are doing to solve problems, they make themselves public. I think we can all agree that when someone, or an organization, is more upfront about how and why things happen, we are more likely to be tolerant when trouble strikes. So for the MTA, opening some communication can only help, and I think Twitter folks in NYC are happy to hear them. For me in Portland, I’m on the Parking Ban email list, so I get an email when there is a parking ban in the city. Without making a call, or guessing, I get the note and move on accordingly. Personally, I like getting emails, but I believe they publish the same information on Facebook and Twitter as well. So you can get it any way that works for you, and that’s a great thing. In looking at my own behavior, the point would be that each of these techniques for publishing is in fact a specific channel, just like TV or radio. In the end, the best chance for you to succeed in today’s business world if you have a lot of customers is to be everywhere your customers are, and give them the choice of how to consume what you have to say. That said, even the Internet Farmer is headed for Twitter eventually, but not today. Are you Tweeting? What are you Tweeting about? Is it personal or business? Share your stories with the Internet Farmer and those who read this blog. NY Times had a nice article today listing 10 tips to building website traffic. As an online marketing specialist, this is the basic idea no matter who you are or what business you are in. Maybe you are a larger company that can spend more on advertising to grow traffic, but overall online success is brought by doing these types of activities. Did you learn anything new? Is this list depressing because you realized it’s a lot of work? Or is there success you have found from exactly these techniques? Tell me your stories! I’m usually wanting to stick to web technologies, online marketing and food in this blog, but I’m inclined to share one small way we can do our part and feel better about the energy we use everyday. It will take a bit of energy to sign up and finalize the change in service providers, but it’s worth knowing that my energy is not from coal or nuclear sources. I tried to do this years ago, and the process was too cumbersome. Then after I moved to where I am now almost 2 years ago I tried again and succeeded. Something seems to have changed, and it was not any more time consuming than filling out your average application form and following up to make sure that your CMP bill made the change in where the power comes from. Now that it’s done, I live knowing that even as I work in my home office all day, it’s green. Is your electricity green? Have any experiences to share? Please comment below! It’s like having a blog or website to write in, but you can only type 140 characters at a time. You might even hear it called “micro-blogging”, and it is to some degree. Some people “tweet”, random nothingness and it is more about friends, but others have put it to work for business. Overall when it comes to business, it works if 1) your audience can and will use Twitter at all; and 2) if you can speak about something vital to your customers about your business. A few weeks ago, I heard a story about a food cart guy in Los Angeles. He “tweets” the location of his lunch cart each day. People seem to flock to this guy no matter where he is, so they get the inside scoop by subscribing to him, and he gets the core of his business… loyal customers. When texting or chatting, people say OMG(oh my god), or brb(be right back), or LOL(laugh out loud). It shortens things, but we understand. What if we could communicate even more complex information in just 140 characters? The following article is what spurred this blog post. Not business related unfortunately, but a creative approach to communicating complicated instructions in under 140 characters. Read the article and you’ll see what’s possible. 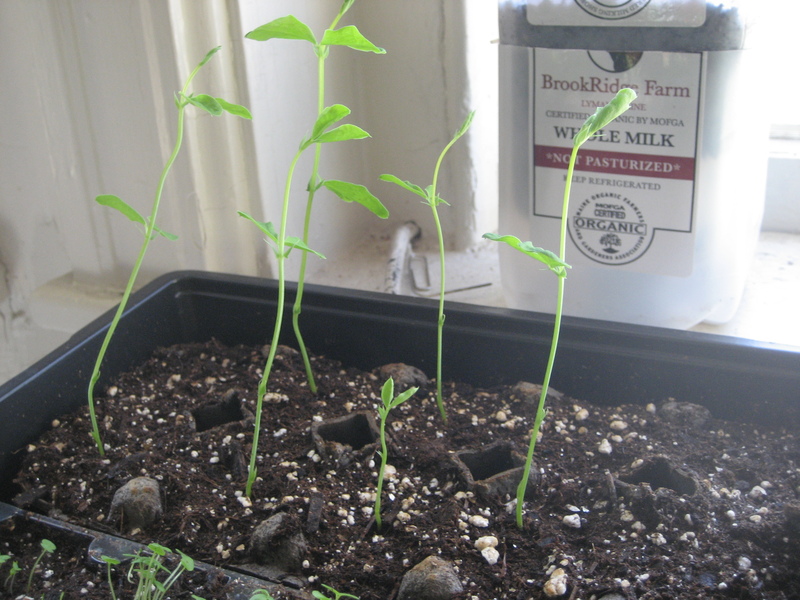 Last year when I worked the first half of a season at Wealden Farm in Freeport, I fell in love with growing seeds. The attachment I had was amazing, and was only realized late in the summer when the harvest came and the little seeds I once planted in a tiny hole were bigger than me and could feed me many times over. Living in Portland and not farming this year, things have changed for this year’s season. Thanks to my also-former-farmer partner Kate, we’ve taken on the city version of farming… container gardening. Our challenge? 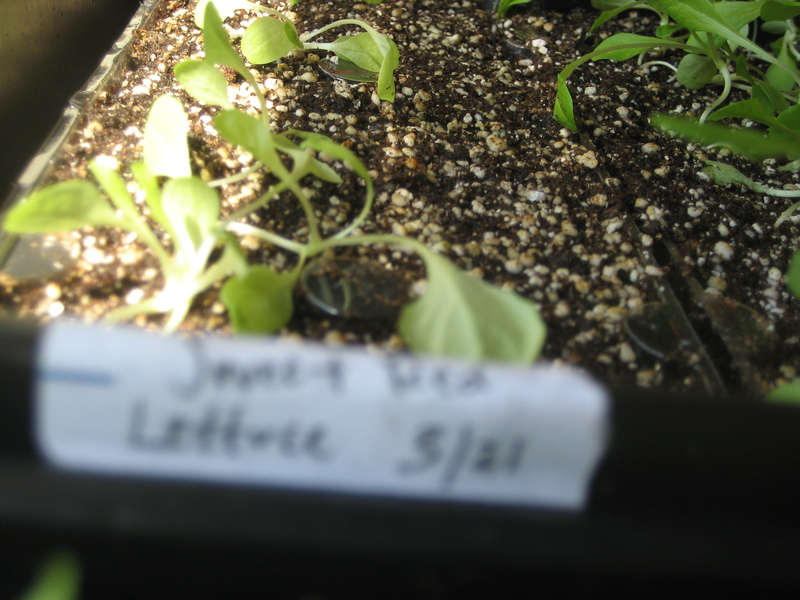 To feed ourselves with lettuce for the summer, and maybe the whole year. This means feeding 4 people who live at our two residences. I’ve also ended up growing a beard the last couple of months. Somehow, I’ve ended up saying that I’m not shaving until I eat some of this lettuce. It will be good to eat my own greens, and be cleanly shaven. Still a few weeks away though. Mid-May is about when we can start eating. 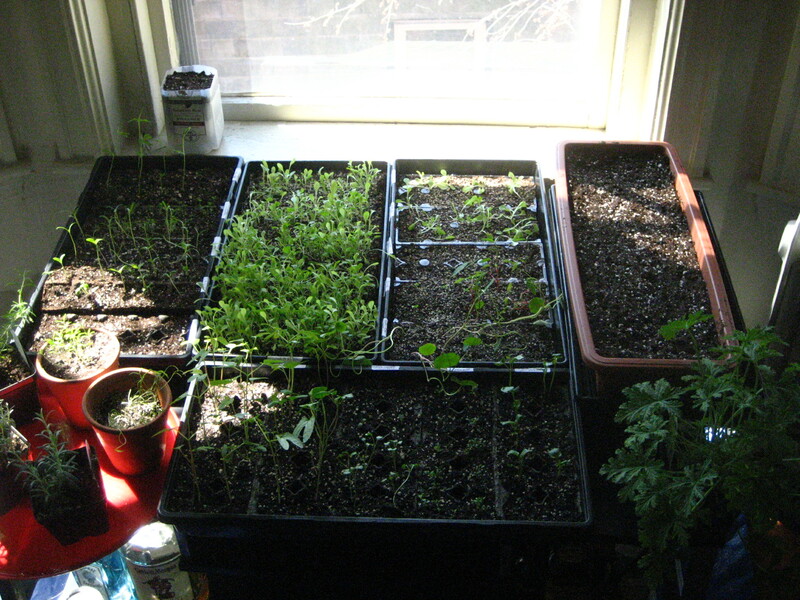 Until my next post, here are some of the first photos of our home-grown-apartment-greens. We are growing flowers too, but I’m all about the food. 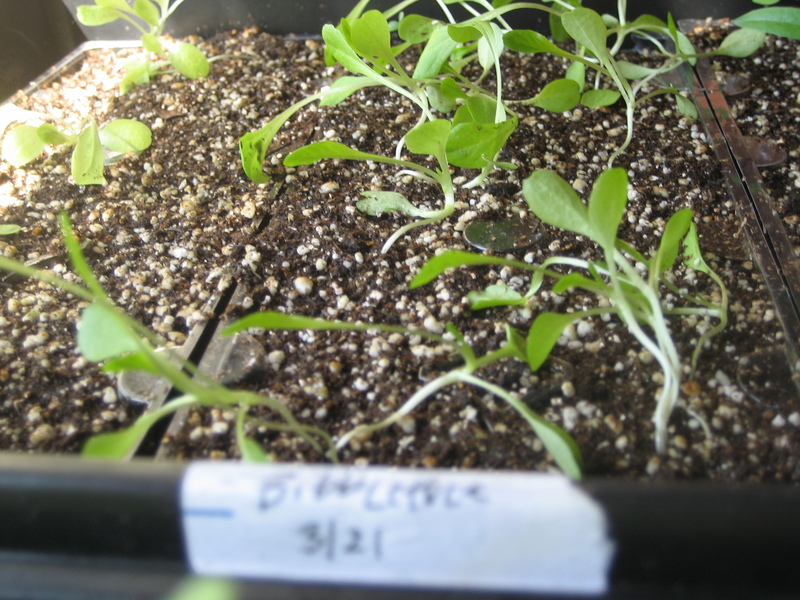 All of this was planted on 3/21, and we will plant new lettuce every two weeks to stay stocked with greens for four. This is the first round of our lettuce and flowers spread out on what was my TV stand. Here is a few types of lettuce, flowers for pollenation and herbs like sage and thyme and rosemary. 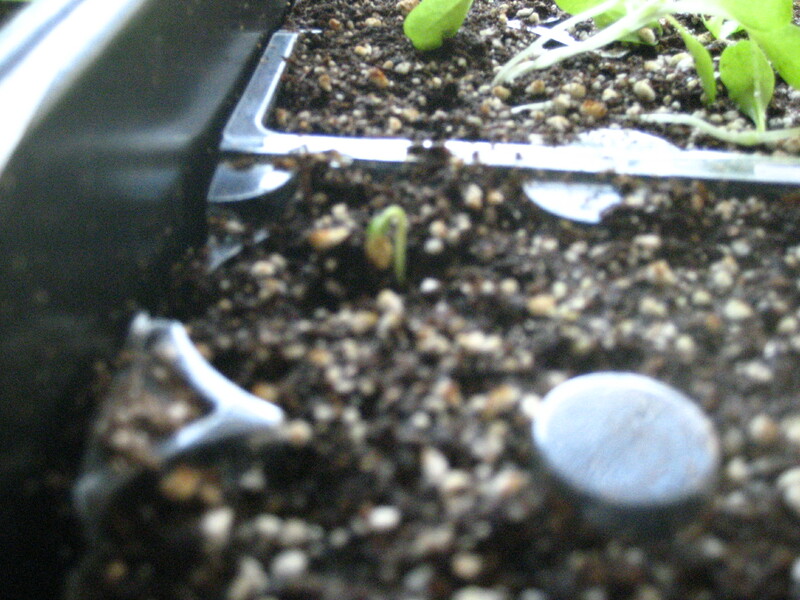 A baby lettuce popping it's head out after 3 weeks. 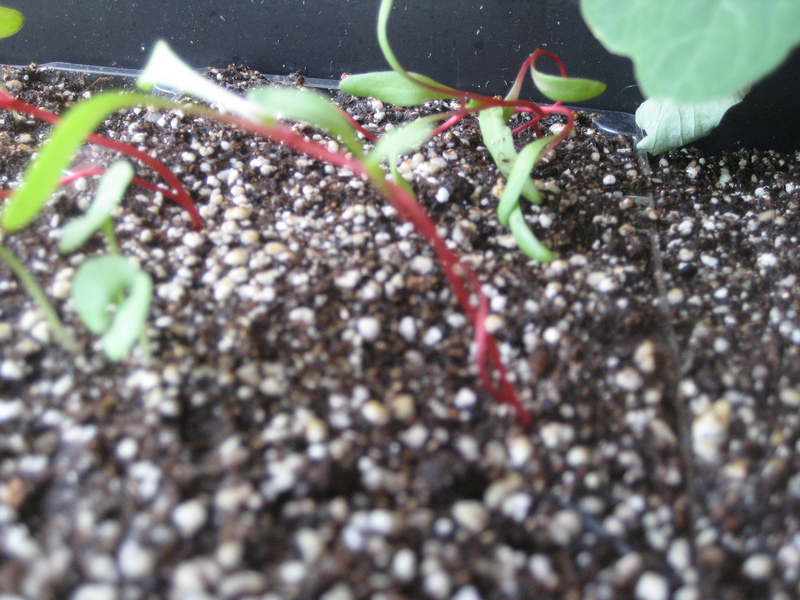 Red Chard looking good, but a little blurry. I'm working on that! My partner wouldn't be happy if I didn't give kudos to a few flowers. Here's her Sweet Pea. Pollenators are obviously a gift of mother nature once we move outdoors. In reading today’s news, Obama is taking yet another leap of faith to use the internet for reaching millions at almost no cost to our tax payers, and it leaves me speechless. Check out whitehouse.gov for the details on Obama’s 1st Online Town Hall. In the realm of online marketing, I can not think of any other activity that could be more effective in connecting with people on a mass scale, and giving us what we voted for. The feeling of having a seat at the table at the white house. I don’t agree with everything about Obama, but he’s really good at providing hope. Something we could all use a little more of. As I learned of what he was going to do today, a tear came to my eye. Why? Because back in ’94 when I first spoke of the internet and mentioned ideas like this, people thought I was nuts. No one could even imagine email (or the hell that email would cause us all! :). So admitedly, I got a little nastalgic when I realized that after 15 years, the Internet I’ve always envisioned as possible is finally here thanks to a tenacious president with the audacity to try something new. “Try” is a key word here. In the intro video he recorded for the town hall, he calls it an experiment. That’s because it’s never been done on this scale. EVER! If it works out well, I predict a whole new trend in marketers holding online town halls about their products and ideas. And why not? You may not be able to address millions, but realistically you don’t have to. You just have to use the idea of asking questions, letting people vote on what questions are important, and then answering in video response. Cheers to you for trying Obama. “A” for effort in my book! In the realm of online marketing projects, you may think it’s complex to do this, but it’s actually quite easy if you focus on the concept and do it with an email form, a web cam and a blog. Thoughts? Did you know of this at all? Did you vote on any questions? Have you ever put up your own podcast or tried an online town hall to market your business? Please chime in with comments below.